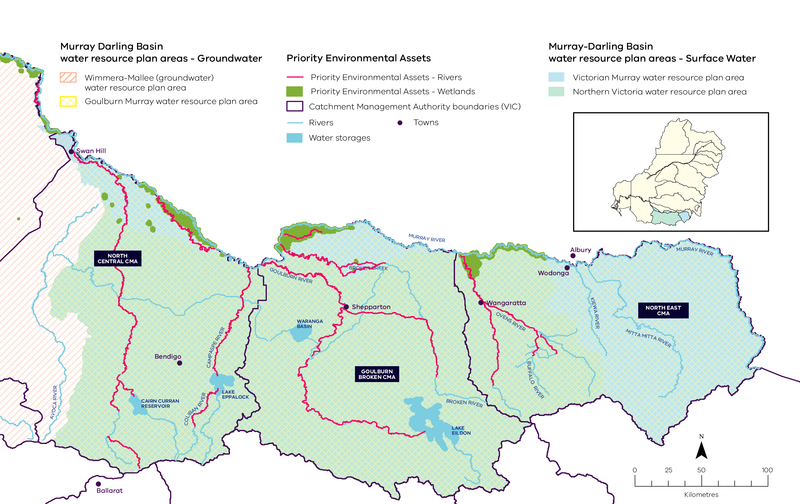 The Victorian Government has prepared a draft Water Resource Plan for northern Victoria as part of our implementation of the Murray-Darling Basin Plan. The Plan is titled Victoria’s North and Murray Water Resource Plan. The draft Plan outlines how we are meeting our Basin Plan requirements for the region, including an explanation of the region’s water resources, and our existing water management framework. The Victorian Government is seeking community input and feedback to inform the final Water Resource Plan for northern Victoria. Your views and ideas are important and the Government welcomes input from anyone with an interest in water resource management in the Northern Victoria region. Water resource plans are required to demonstrate, among other things, how States will comply with reduced limits on how much water can be taken from surface water and groundwater sources, and how it will be used for towns, agriculture and industry. The 2012 Basin Plan set a new limit on how much water could be taken across the Basin. States need to comply with the new limits from July 2019. Our Basin Plan water recovery target for northern Victoria is an annual average of 1,052 GL of surface water for the environment. The water recovered to improve the health of our rivers and land includes water saved by upgrading and modernising irrigation systems, as well as water recovered from farmers by the Federal Government in return for modernising and upgrading irrigation systems on their farms. For further detail on the progress of water recovery in Victoria, go to the Murray-Darling Basin Authority’s Progress on water recovery page. Learn more about Water for the environment and in Chapter 12 of the draft Water Resource Plan in the Document Library. Victoria believes our existing water management framework and policy largely meets the remaining Basin Plan requirements for northern Victoria. The draft Victoria’s North and Murray Water Resource Plan sets out how we meet our Basin Plan requirements under our existing instruments and tools. Learn more about Water resource planning in northern Victoria. Community input is critical to ensure the draft Plan reflects reality on the ground across northern Victoria and so there is confidence in how the Basin Plan is being implemented by the Victorian Government. The Victorian Government is working with Traditional Owners and Aboriginal communities to deliver the Aboriginal water commitments outlined Government's water plan, Water for Victoria. Further information about this topic is available under Chapter 8 of the draft Water Resource Plan in the Document Library. Feedback to the document will help ensure the final comprehensive report reflects the voices of Traditional Owners and Aboriginal communities in northern Victoria and explores how Aboriginal water may interact with other water management areas. Learn more about Aboriginal water objectives and outcomes. Note: Due to file size restrictions, the images within the full comprehensive report have been compressed in quality to create a smaller file. The individual chapters within the document library contain higher quality files. Please contact us if you would like a high resolution digital copy of the comprehensive report or a hard copy by post. What is your view on the plan? Please contact me about my submission (optional). Feel free to come to our drop in sessions. No RSVP required. More public meetings may be held if required. Watch this space.